Valves are linear with slightly convex margins and capitate apices. The axial area is linear and very narrow, widening slightly near the central area. The central area is a broad stauros shaped like a bow tie. The raphe is filiform and straight, with slightly expanded proximal ends. Striae are slightly curved and strongly radiate. Areolae are difficult to resolve in LM and number near 40 in 10 µm. Stauroneis agrestis has been recorded from small lakes, ponds and streams in the northern Rocky Mountains where mean pH is 6.6 and mean conductance is 9 µS/cm. Van de Vijver et al. (2004) report S. agrestis as an aerophile that is widespread in the Arctic. Werum and Lange-Bertalot (2004) report it from springs in Germany and the central Alps. 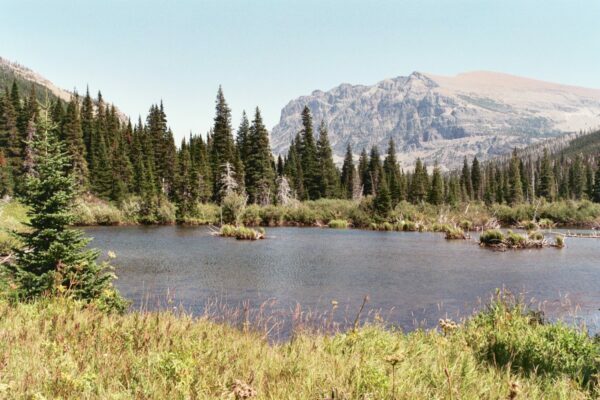 Atlantic Pond, Atlantic Creek drainage, Glacier National Park, MT: home of Stauroneis agrestis. Petersen, J.B. (1915) Studier over danske aerophile alger. Mem. Acad. R. Sci. Lett. Danmark, 7. Ser. 12: 269-380. Van de Vijver, B., Beyens, L. and Lange-Bertalot, H. (2004) The genus Stauroneis in Arctic and Antarctic Regions Bibliotheca Diatomologica 50, 312 pp. Stauroneis agrestis has linear valves 23-27 µm long with capitate apices. Proximal raphe ends are straight. The stauros is broad and shaped like a bow tie. 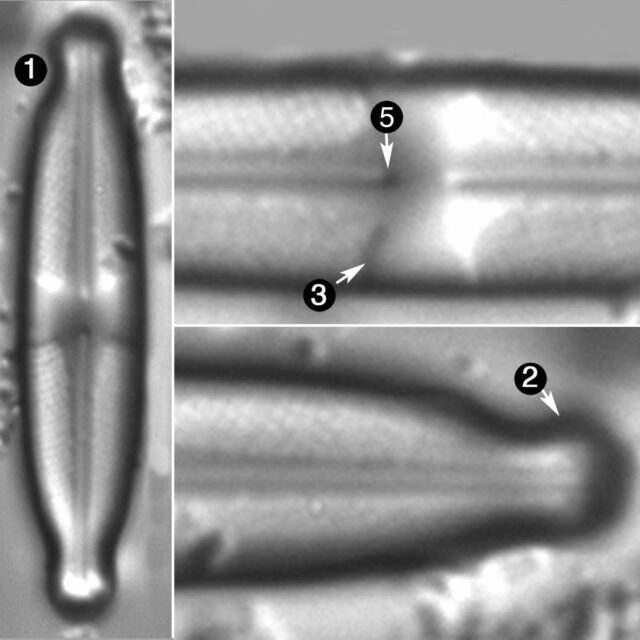 Striae are strongly radiate and number near 40 in 10 µm.